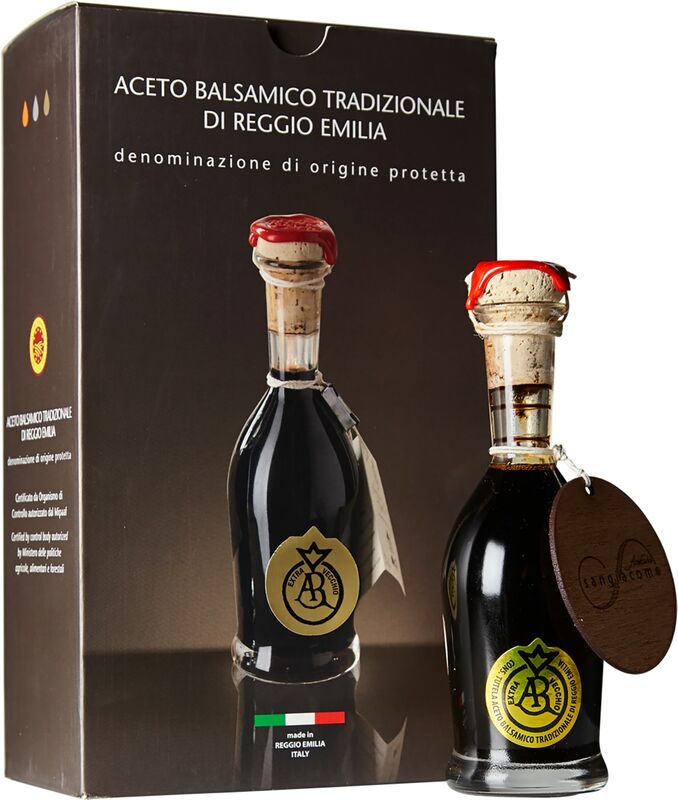 Aceto Balsamico Tradizionale di Reggio Emilia by San Giacomo Gold label is also called Extra Vecchio, and for good reason; this traditional balsamic has been aged at least 25 years in the oldest wooden barrels that producer Andrea Bezzecchi inherited from his great-grandparents. With a rich, viscous consistency and perfectly balanced flavor, we think it’s perfect on its own; in Emilia-Romagna, a teaspoon of this precious liquid is considered a delicious after-dinner digestive. It also goes particularly well with rich and creamy dishes - mix it into classic Emilian recipes like pumpkin risotto with Parmigiano Reggiano, or drizzle a few drops on fresh cheese, vanilla gelato or sweet ripe fruit. Traditional balsamic vinegar, however, is made by boiling grapes before they ferment, and can only be produced in the regions of Modena and Reggio Emilia. Local grapes are harvested at the peak of sweetness and cooked in open vats until they’ve boiled down to one-third the volume. This concentrated must is transferred to wooden barrels, made of different types of wood that impart their own complexity of flavor and aroma - oak, chestnut, mulberry, cherry and juniper. Each barrel has a hole in it to encourage evaporation; as the water evaporates the liquid becomes more and more concentrated, and is transferred to progressively smaller barrels. This process takes years - and only when the final product is tasted and approved by the certifying committee can it bear the DOP label. Andrea produces three levels of traditional balsamic, differentiated by the color of their labels: Red, aged for a minimum of 12 years; Silver, aged for 18-25 years, and Gold, also called Extra Vecchio, aged for more than 25 years.